Styson was born and raised on the Big Island, and graduated from Honoka‘a HS in 2008. 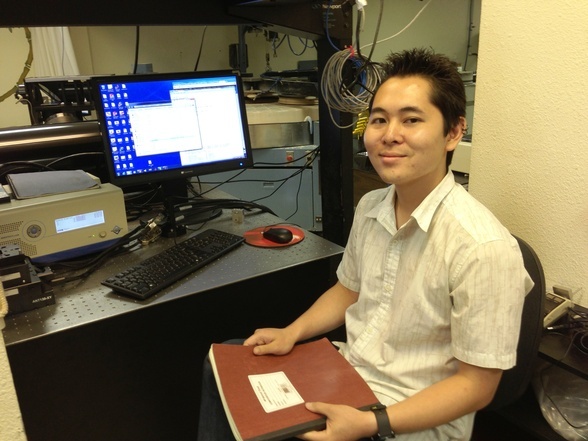 He then attended UH Hilo for two years while majoring in Pre-Engineering. While participating in the National Student Exchange program at Northern Arizona University, he decided to remain at NAU, and he recently completed his bachelor’s degree in Mechanical Engineering. For hobbies, Styson enjoys snowboarding, cooking, and watching movies. HNu Photonics is currently constructing a confocal microscope for the Defense Advance Research Project Agency (DARPA). This microscope is designed to achieve super high resolution at a fraction of the cost of most commercially available systems. This confocal microscope is also designed to be uniquely achromatic in operation and be able to optically resolve features that are less than one micron in size. To achieve this level of resolution, HNu Photonics has developed a unique solution. This requires an exceptionally accurate specimen positioner and highly accurate measurements. The focus of this project concentrates on three objectives: testing of the AEROtech nano-positioner, aid in constructing the graphical user interface (GUI) for this positioner, and testing as well as optimization of the overall device. Through testing that uses an interferometer, data shows that the AEROtech nano-positioner is accurate when moving in 100nm increments. This was also verified using a standarized US Air Force target and optical imaging. However, further analysis in a more stable environment is required to determine if this device is accurate for smaller step sizes. Currently, the GUI for this positioner is also near completion and has basic movement functionality and scanning capabilities. It is anticipated that this device will have its mechanical setup near complete along with its accompanying GUI within the next few weeks.